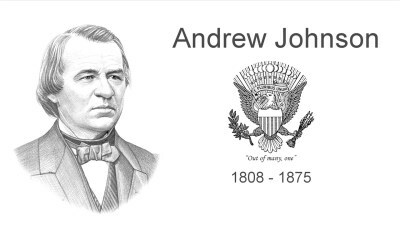 Andrew Johnson was the 17th President of the United States, serving from 1865 to 1869. 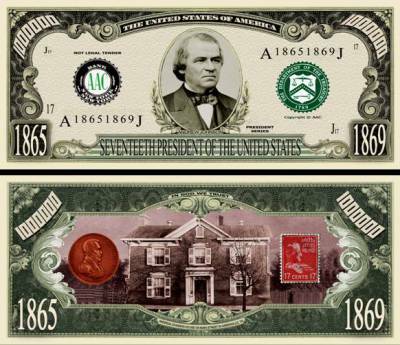 Johnson became president as he was vice president at the time of President Abraham Lincoln's assassination. 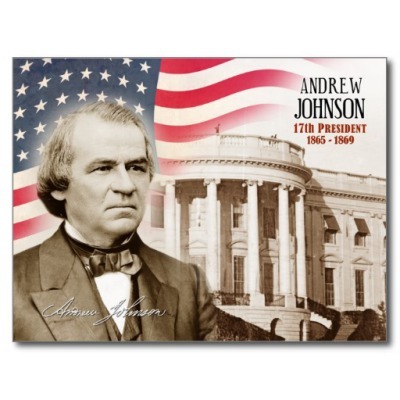 Andrew Johnson (1808-1875), the 17th U.S. president, assumed office after the assassination of Abraham Lincoln (1809-1865). 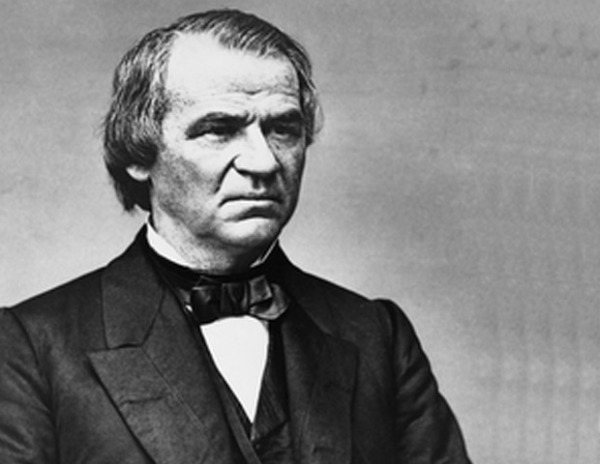 Johnson, who served from 1865 to 1869, was the first American president to be impeached. A tailor before he entered politics, Johnson grew up poor and lacked a formal education. He served in the Tennessee legislature and U.S. Congress and was governor of Tennessee. A Democrat, he championed populist measures and supported states’ rights. During the U.S. Civil War (1861-1865), Johnson was the only Southern senator to remain loyal to the Union. Six weeks after Johnson was inaugurated as U.S. vice president in 1865, Lincoln was murdered. As president, Johnson took a moderate approach to restoring the South to the Union and clashed with Radical Republicans. In 1868, he was impeached by Congress, but he was not removed from office. He did not run for a second presidential term. When Lincoln sought re-election in 1864, he chose Johnson as his running mate over Vice President Hannibal Hamlin (1809-91), a former U.S. senator from Maine. As a Southern Unionist and “War Democrat” (the name for those Democrats who stayed loyal to Lincoln), Johnson was deemed a good fit for the ticket. Lincoln defeated his opponent General George McClellan (1826-1885) by an electoral margin of 212-21 and garnered 55 percent of the popular vote. The president and new vice president were sworn into office on March 4, 1865. Johnson, who was recovering from typhoid fever, drank some whiskey before the ceremony, believing it would make him feel better. Instead, he gave a slurred, semi-incoherent inaugural address, leading to persistent rumors that he was an alcoholic, although he was not. On April 9, at Appomattox, Virginia, General Robert E. Lee (1807-1870) surrendered his Confederate army to General Ulysses S. Grant (1822-1885), effectively ending the Civil War. Five days later, on April 14, while Lincoln was attending a play at Ford’s Theater in Washington, D.C., he was shot and fatally wounded by Confederate sympathizer John Wilkes Booth (1838-1865). By the next morning, Lincoln was dead at age 56. That same day, Johnson was sworn in as president at his Washington hotel by the chief justice of the U.S. Supreme Court, Salmon Chase (1808-1873). As it happened, Johnson himself escaped death, because the assassin Booth’s original plot had also targeted the vice president and U.S. Secretary of State William Seward (1801-1872). Seward was attacked but survived, while Johnson’s assigned assailant, George Azterodt (1835-1865), lost his nerve at the last minute and did not go after Johnson. 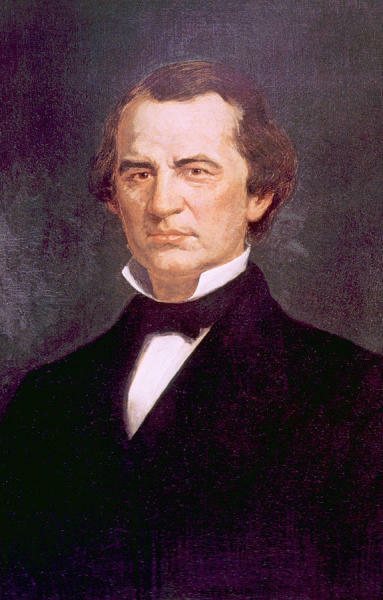 Once in office, Johnson focused on quickly restoring the Southern states to the Union. He granted amnesty to most former Confederates and allowed the rebel states to elect new governments. These governments, which often included ex-Confederate officials, soon enacted black codes, measures designed to control and repress the recently freed slave population. When the U.S. Congress convened in December 1865, it refused to seat the newly elected Southern members, and Johnson found himself at odds with the legislature, particularly the Radical Republicans, who viewed the president’s approach to Reconstruction as too lenient. In 1866, Johnson vetoed the Freedmen’s Bureau bill and the Civil Rights bill, legislation aimed at protecting blacks. That same year, when Congress passed the 14th Amendment granting citizenship to blacks, the president urged Southern states not to ratify it (the amendment nevertheless was ratified in July 1868). During the 1866 congressional elections, Johnson launched a multiple-city speaking campaign, dubbed “a swing around the circle,” in which he attempted to win support for his Reconstruction policies. The tour proved to be a failure, and the Republicans won majorities in both houses of Congress and set about enacting their Reconstruction measures. Hostilities between the president and Congress continued to mount, and in February 1868, the House of Representatives voted to impeach Johnson. Among the 11 charges, he was accused of violating the Tenure of Office Act by suspending Secretary of War Edwin Stanton (1814-1869), who opposed Johnson’s Reconstruction policies. That May, the Senate acquitted Johnson of the charges by one vote. Johnson did not run for reelection in 1868. He had hoped the Democrats would choose him as their presidential nominee, but they opted instead for Horatio Seymour (1810-1886), a former governor of New York. Civil War hero Ulysses Grant, the Republican candidate, won the election and became the 18th U.S. president. Johnson’s interest in politics and public office did not end once he left the White House in March 1869 and returned home to Tennessee. That same year, he ran unsuccessfully for the U.S. Senate, and in 1872, lost his bid for a seat in the U.S. House of Representatives. He persisted and won election to the Senate in 1875. 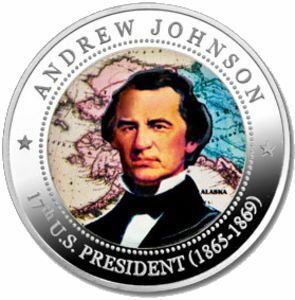 Johnson was the only ex-president to accomplish this feat; however, his Senate tenure was brief. He died at age 66 on July 31, 1875, after suffering a stroke while visiting family in Carter County, Tennessee.